Do you know what fascia is? You should. It’s affecting your health and well-being right now. We now know that fascia is the most important connective tissue we have in our bodies. It is the intricate, layered and continuous web of connective tissue that surrounds and supports every aspect of your body. It attaches to the skin and weaves its web deeply down to surround the brain and spinal cord. Every one of our cells is infused with fascia. Part of this fascial system is a matrix or ground substance that when healthy is like viscous jello in consistency. We can liken the relationship of the fascia to the rest of the body by imagining a candle that has bits of shell and rock in it. The wax is the fascia and the bits of shell and rock are everything else. Just like if we were to melt the wax in the candle, if we took away our fascial system, we would be a pile of goo, bones and electric charge on the ground. When it’s healthy, it allows everything to work properly. We feel like lycra when we move, our bodies can reach and stretch and stay strong in many different positions and movements. We feel physically free. We can sustain a minor, and sometimes even a moderate impact, then bounce right back. Our organs work well, and we have enough energy. When it’s injured or what we call restricted, we feel tight, our movements are limited, we can’t hold positions for long, we feel pain, and muscles in our body feel knotted. We may get sick a lot or have low energy. Over 80% of musculoskeletal pain and dysfunction is caused by restricted fascia, no matter what the diagnosis is. So, how does this happen? How does it become restricted or get out of balance? There are several ways. One is from an acute injury like a fall, or a car accident. Two is from surgery, scar tissue can be a major fascial restriction. Three is from repetitive motion or postural stress such as sitting hunched over a computer all day or a neurological condition such as cerebral palsy. Four is from inflammation that doesn’t resolve and hardens over time. When any of these events happen, our bodies own healing mechanism kicks in to add extra layers of collagenous support. 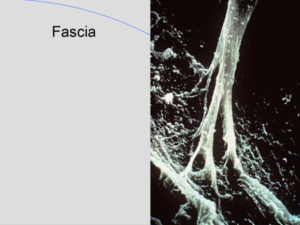 Collagen and elastin are the main components of fascia. Collagen is the strongest material in the body with a tensile strength of 2000 lb’s per square inch, it provides fascia with incredible strength. Elastin gives us our flexibility. These extra layers are restrictions; they feel hard, and ropy. They are perfect for providing temporary support for those repetitive movements and areas under postural stress, and will help injured areas to heal. The down side is that if left permanently the overall system has an area of weakness, and a snag that will tug on and affect the rest of the fabric, much like pulling the threads on a sweater. The more restrictions our fascial fabric has the less likely we are to sustain an impact without injury, and the more likely we are to feel pain and lack of motion. You see it’s the fascial system that determines our bodies balance or lack of balance. It’s not our bones that hold us up, it’s our fascial fabric that keeps everything in place including bones. Keeping our fascial system healthy allows us to live an active and pain free life with good energy. It’s the key to preventing injury and will assist in preventing illness and disease. A skilled myofascial release practitioner will evaluate your fascial fabric to identify where the restrictions are. You may be surprised what they find! Then, they will use specific hands on techniques as well as home exercises to get it to release, and back to its original style.